less frequent but very strong hurricanes are at play. As published in a journal many years ago (since at least 2005). The past 12 years were not exactly busy ones for hurricanes, quite unlike typhoons. March 2017 Saharan dust plume North Africa is seen to the upper right. 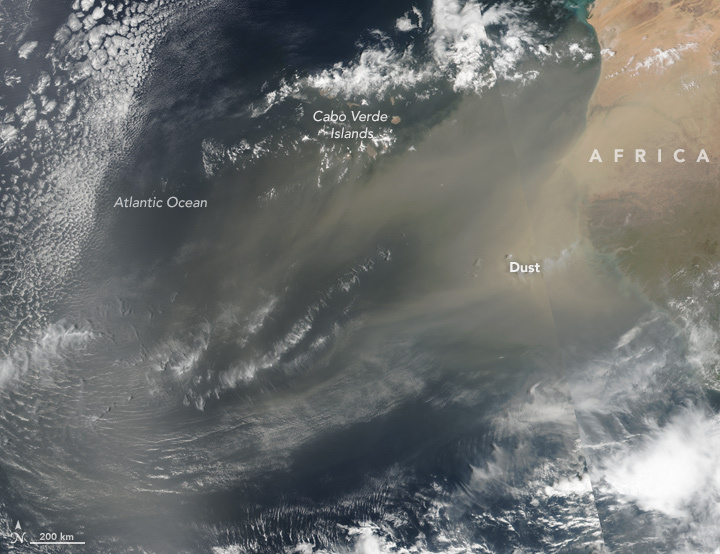 It makes a great deal of sense that dust may simply inhibit hurricane development, also likely a warmer planet, in turn Sahara, will diminish the number of hurricanes forming. Hence the likely further warming of "uncooled" South Atlantic sea water, as it is known, that hurricanes mix the underlying lower cooler layer of sea water with the very warm surface sea under its path. The further warmed more stable sea water may give incredibly stronger hurricanes whenever the conditions are ripe.